Saudi Arabia has today announced establishment of “Islamic military alliance” with a mission to fight terrorism. A Riyadh-based military coalition consisting of 34 countries will fight terrorism, with a joint operations centre based in Riyadh to coordinate and support military operations. Azerbaijan, a nation that rendered great contributions to the Islamic unity and also a country, which has been suffering from terrorism over the years, is considering joining the coalition. Hikmet Hajiyev, Azerbaijani foreign ministry spokesman stated that this issue was discussed during the phone conversation between Azerbaijan’s Foreign Minister Elmar Mammadyarov and his Saudi counterpart Adel al-Jubeir. Hajiyev told Trend news agency that as a country suffering from terrorism, Azerbaijan strongly condemns all its forms and continues to be an active participant of the fight against international terrorism. Azerbaijan has become an object of Armenian terrorism since the beginning of 20th century and it continues till nowadays. The Armenian aggression against Azerbaijan has lead to the occupation of the country’s internationally-recognized territories and put an end to the life of over 20,000 Azerbaijanis and the fate of more than 4,500 people remains uncertain. Also more than 2,000 of Azerbaijani citizens become victims of the terrorist attacks committed in Azerbaijan by Armenian terrorist groups in different times. Hajiyev further said that under Azerbaijan’s legislation, country’s participation in the structures of any kind should be considered based on the requirements of internal procedures. As the Saudi Arabia's anti-terrorist coalition envisages combating terrorism on the military, ideological and informational fronts, the experts suppose that Azerbaijan can join the alliance on ideological and informational fronts. Commenting on the issue, Azerbaijani MP Rasim Musabeyov told AzerNews that Baku could participate in exchange of information within this alliance. “I don’t think that Azerbaijan will send troops somewhere within the coalition. However, I assume that Azerbaijan will probably participate in the exchange of information,” he said. Musabeyov said there are also Azerbaijanis among participants of the terrorist groups, such Islamic State of Iraq and Syria terrorist organization and etc., which are source of threat not only for Syria, Iraq, but for Azerbaijan also. Using the various methods, ISIS terrorist organization, which became great threat to the stability in the Middle East, attracts people from all over the world. Unfortunately, Azerbaijan is not an exception. This creates great concern of the Azerbaijani public and the government is taking various measures to prevent Azerbaijanis’ joining terrorist organizations. Rules and laws have been tightened in the country in recent years to prevent citizens to join the radical and extremist groups. 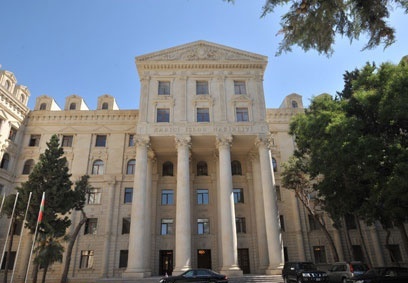 Under the new changes made to the Azerbaijani legislation, the individuals engaged in the terrorist activity, religious extremist activity, or those joining the religious conflicts taking place in a foreign country under the guise of religion and etc. will lost the citizenship. Also, those will bear imprisonment for a term of 5 to 11 years for not only terroristic activity, but also steps aimed at contributing such an activity. For the collection of mercenaries (warmongers), the organization of their training, funding or providing other financial support, as well as their use in armed conflicts and operations is set a penalty of imprisonment from 8 to 12 years. Baku has repeatedly announced that all terrorist acts are unjustifiable regardless of their motivation, constitute serious crimes and must be condemned and prosecuted. The Azerbaijani officials have repeatedly stated that the war on terrorism cannot and must not be used to target any religion or culture.